Consider a Clarity Enhanced Diamond. Amidon Jewelers is the exclusive Yehuda Diamond Dealer in the area, offering a great value option to our guests. This revolutionary process optically eliminates "feathers", which are naturally occurring in most diamonds. The result is a more visually stunning diamond that you can purchase for significantly less than a similar-looking, non-enhanced diamond. Yehuda Diamonds from Amidon Jewelers are totally natural and the clarity enhancement is not visible to the naked eye. This revolutionary process optically eliminates "feathers", which are naturally occurring feathers in most diamonds. The result is a more visually stunning diamond that you can purchase for significantly less than a similar-looking, non-enhanced diamond. Only an experienced Jeweler with proper tools will ever know that you own a Clarity Enhanced Diamond. Technically it works like this: When light travels from one medium to another, it either changes its course or reflects in a different direction. When light attempts to pass through a non-enhanced diamond that has a feather, the light hits the feather and reflects off in any number of directions. That is why we see the feather and the diamond doesn't appear to be clean. With a Yehuda diamond, the light passes through the natural feather because the material used for the enhancement has the same optical characteristics as the diamond. The beam of light "thinks" it's still traveling through the same material (diamond) and continues its original course. During the Yehuda clarity enhancement process a microscopic amount of material is inserted into the part of the diamond that contains a feather. This material has the same optical properties as the diamond itself. Does Clarity Enhancement "Change" A Diamond In Any Way? No, it is still a natural diamond - it just looks better. The amount of material used to fill the feather is so microscopic that even the world's greatest diamond laboratory, the Gemological Institute of America (GIA) has reported that this exclusive clarity enhancement process adds ZERO WEIGHT to a diamond. Take a look at the before and after pictures below and judge for yourself. Do I need to take care of my Yehuda diamond differently than other diamonds? Absolutely Not. 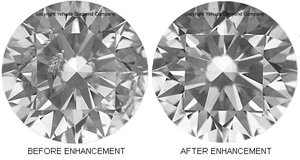 The Gemological Institute of America (G.I.A), after extensive research, has determined that normal wear and tear cannot harm the enhancement. Only if the Yehuda diamond is exposed to high heat or strong acids and bases, the enhancement may be reversed. In the extremely rare case that a Yehuda Diamond should lose its enhancement, Amidon Jewelers will work with Yehuda to re-enhance the diamond at no charge, no questions asked. With each diamond sold, we provide a Lifetime Guarantee. As a result, Amidon can offer you visually stunning diamonds for the price of 20-30% less than similar looking non-enhanced diamonds. Amidon Jewelers offers you the option to: save money or purchase a bigger, more beautiful diamond.